Do you know how many people lived in Wisconsin in 1920? 2.6 million people. My only lead to find Minnie Kurtz's brother was from her obituary which stated she had "a brother in Wisconsin". No first name, no town name and at this time, I didn't even have Minnie's maiden name. Chances of finding her brother....zero. The other day, I was given a clue by a distant relative that they believed that Minnie Kurtz's maiden name "Salefski". Ok. It wasn't much, but it was a start. Chance of finding her brother.....greater than zero, but not by much. I did a search on Ancestry.com to see if I could find any "Salefski's" in Wisconsin. There appeared to be an army of Salefski's in Illinois, but I only found what appeared to be one family in Wisconsin. Could this be the one...and if so, how do I prove it? I found a couple who appeared to be the first of the Wisconsin Salefski's, August and Charlotte Salefski. I found an existing family tree for the Salefski's. It appeared that August Salefski was born about 1854 in Germany. He and Charlotte had three children: Mary, Frederick and Edward. According to the family tree each of these children were born in Pennsylvania. One thing I love about Ancestry.com is that you can contact other users to ask them about their family trees and share information. I sent an email to the most complete Salefski family tree in Wisconsin I could find and waited. I was contacted by Bruce Beyerlein that same day. He was unaware of August Salefski having any sisters....in Pennsylvania or anywhere else. However, he was able to confirm that August and Charlotte's children were born in Trotter, PA in Fayette County. Trotter is very close to where Minnie Salefski Kurtz lived in Connellsville, PA.
What was great, was Bruce started some research on his Salefski side of the family to see what he could find. Shortly, he was able to find August and Charlotte's arrival at Ellis Island. They arrived on Nov 9 1883. Their destination once they landed in the US was Connellsville, PA. The same town his sister was living in. August and Minnie Kurtz arrived in the US in 1881. So they were probably on their way to live by his sister. One other benefit from Bruce's research was that he found a previously unknown child of August and Charlotte Salefski. Their daughter Augusta who was born in Germany, who came with them to the US. As it turns out she moved to Wisconsin and married Ferdinand Koehler about 1900. August Salefski died in Hamburg, Wisconsin on August 1, 1934. Not much question, August Salefski is Minnie's brother. Never one to leave any stone unturned, I have requested some early church records that should provide some additional detail about August and Charlotte and their children while they lived in Fayette County. Very Thankful the help that Bruce has given me. I have said it before and I will say it again. I continue to be impressed by the assistance fellow researchers so freely give me in my family odyssey. The Burning of Falmouth, Maine by British forces on October 18, 1775 fanned the flames of revolution across the country, for those living in and around Falmouth (present day Portland, Maine) and Cape Elizabeth, it reinforced their feelings for the need for the creation of an independent nation from England. Shortly after this atrocity, my 4th great grandfather, John Armstrong, enlisted in the revolutionary cause and joined the Massachusetts Militia. One of his first roles in the revolution was to be assigned under Colonel Jonathan Mitchell in the construction of Fort Hancock to build a defense in Maine against further potential attacks. Fort Hancock became the basis for Fort Preble and was expanded and used during the War of 1812, Civil War, WWI and WWII. 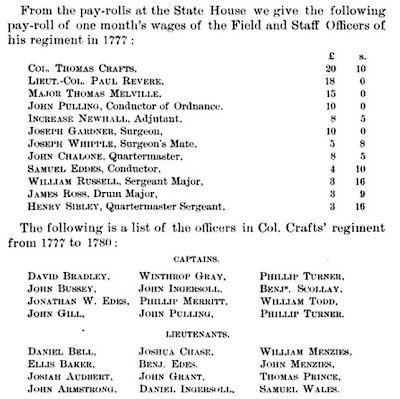 According to the records I could uncover, John Armstrong attained the rank of Lieutenant and served in Colonel Thomas Craft's Artillery Regiment. He served in both the Massachusetts Militia or Continental Army from November 1775 - February 1779. After the British abandoned Boston, the colonials took over Castle Island, then known as "Castle Williams" which was a fort built on a small island in Boston Harbor. This is where Col. Craft's regiment was stationed to protect the city against any future attacks by British forces. The British did not return. There is no evidence I can find that Lt. John Armstrong saw any combat. One of the most interesting things I did find about his service is that he served under someone you may have heard of Lieutenant Colonel, Paul Revere. While we all know about Paul Revere's ride to alert the colonists that the "British are coming!! ", many don't realize that he then served in the Massachusetts Militia for the rest of the war. “Thursday last, pursuant to the order of the honorable council, was proclaimed from the balcony of the State House in this town, the Declaration of the American Congress, absolving the United Colonies from their allegiance to the British crown, and declaring them free and independent states. 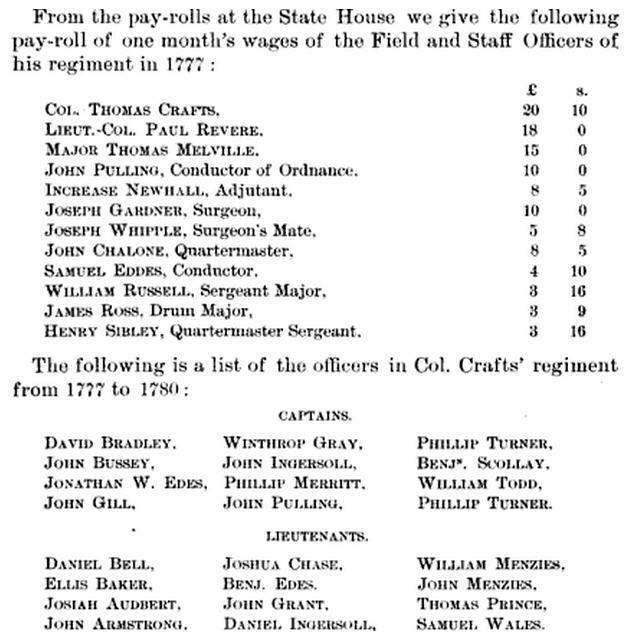 There were present on the occasion in the council chamber, a committee of council, a number of honorable house of representative, the magistrates, selectmen and other gentlemen of Boston and the neighboring towns, also the commission officers of the Continental regiments stationed here, and other officers. Two of these regiments were under arms in Kings Street, formed into three lines on the north side of the street and in thirteen divisions, and a detachment from the Massachusetts regiments of artillery, with two pieces of cannon, was on their right. At one o’clock, the Declaration was proclaimed by Col. Thomas Crafts, which was received with great joy expressed by three huzzas from a great concourse of people, assembled on the occasion. After which, on a signal given, thirteen pieces of cannon were fired from the fort on Fort-hill; the forts of Dorchester Neck, the Castle, Nantasket, and Point Alderton likewise discharged their cannon. Then the detachment of cannon thirteen times, which was followed by the two regiments giving their fire from thirteen divisions in succession. These firings corresponded to the number of American states united. It must have been quite a stirring occasion, to hear the public reading of the declaration and be there to take the first steps of America as a free nation. And, maybe, just maybe, Lt. John Armstrong, may have been there to hear it. Don't you love modern medicine! If you don't, you should. Most of us don't know what it was like back before modern medicine, when diseases such as scarlet fever, typhoid, cholera and polio were common place and often fatal. It wasn't unusual that most family's had at least one child die from an infectious disease. 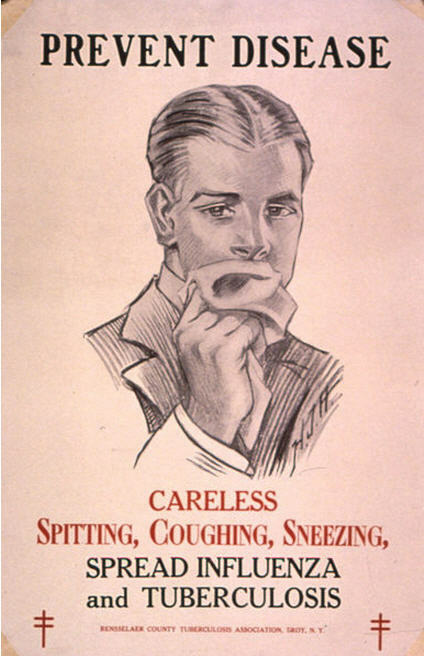 One of the most fatal diseases in the 1800's was tuberculosis. At the time, it was commonly known as "consumption". It was nicknamed consumption, because it wasted the person away over time, until they were emaciated and finally died. At this time, tuberculosis was responsible for the deaths of one out of every 7 people. Tuberculosis is a respiratory disease and can lay dormant in the human body for years until the immune system is weakened. At the time, tuberculosis was seen as an "orderly" disease, meaning it gave you plenty of time to get your affairs in order before it killed you, but it almost inevitably did. People often lived with the disease for years. 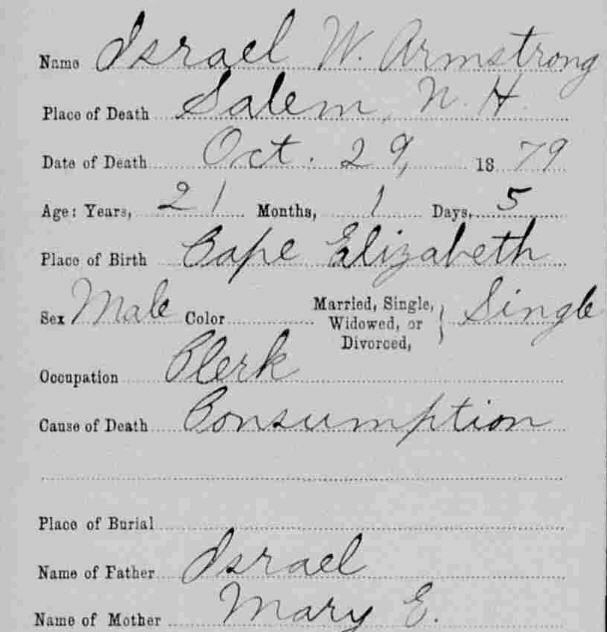 Between 1875 and 1880, Israel Armstrong moved his family to Salem, NH. Israel was my 2nd great grand uncle. He was born in Cape Elizabeth, Maine on December 26, 1824. He married Mary E Sawyer in 1851 and together they had at least 8 children: Joseph, Mary, Israel Jr, John, William, Walter, Edith and Alice. 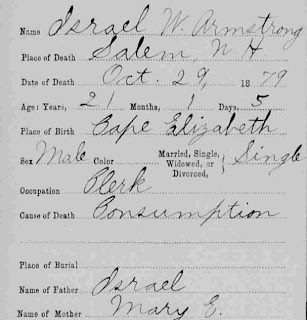 The 1880 US Census identifies Israel living with all his kids and his mother-in-law (also named Mary Sawyer) in Salem, NH. He was a widow as his wife had died in 1875. His occupation is given as a Farmer. However, the details aren't clear, but Isreal tried a number of different occupations and moved around a lot for the time. Perhaps, he was looking for the right opportunity which would support his family. In the late 1850's he was a "Trader" in Portland, Maine, in the late 1860's he ran a small private school called the "Armstrong School" in Everett, Massachusetts, before finally settling in Salem, New Hampshire as a farmer. Sadly, Salem, NH would not be a happy home for the Armstrong family. One by one, all of Israel's children succumbed to tuberculosis. Only, Israel's oldest son, Joseph W Armstrong escaped. Israel Jr. was the first to die in Oct 1879. He was only 20 years old. Walter Armstrong died May 1884. He was 17 years old. John Armstrong died Jan 1885. He was 23 years old. Edith Armstrong died Dec 1885. She was 15 years old. Alice Armstrong died Dec 1888. She was 13 years old. William Armstrong died May 1894. He was 30 years old. He was married, but I haven't found record of the marriage, his wife or if he had any children. I can't find any record of Israel's daughter, Mary. Perhaps she survived and married. Amazingly, these were not small children being struck down by this illness, but strong young people some of them just entering the prime of their lives. Israel's mother-in-law, Mary Sawyer, lived with them during the tuberculosis outbreak. She did not die from this disease. She died Jan 1882, she was 76 and the death certificate lists cause of death as "old age". Finally, Israel Armstrong succumbed to the disease and died Nov 1892 at 67. How did Joseph W Armstrong, escape death when the rest of his siblings didn't? We will probably never know. We do know that Joseph Armstrong lived in Salem, NH throughout at least the 1880's, but he did move with his family to Cape Elizabeth, Maine. It is likely he moved back around the time his grandmother's will granted him land in 1897. See my post on the "Armstrong Family Land Division - 1897" for more details. Joseph W Armstrong died in 1916 at the age of 64. Family stories like this definitely make me more appreciative of the benefits of modern medicine.